Member of the European Association of Agricultural Economists, the Balkan Scientific Association of Agricultural Economists, the Scientific Association of Serbian Economists, the Serbian Association of Agricultural Economists, and the Belgrade Association of Economists. Member of the EU Food Unique network (the international expert group). Contributed definition of the Draft Law on Public Warehouses within the high level working group (Project Current State and Modeling of Wheat Public Warehousing System in Serbia, financed by The Republic of Serbia Ministry of Agriculture, Forestry and Water management 2003-2009). Participated the Ministry of Agriculture, Trade, Forestry and Water management working group focused on The Commodity Exchange Act (2011-2012). University of Kiel, Germany (2004). Teaches Agricultural Economics at the Undergraduate level and agro-rural courses at Master level (Study program – Economic Policy and Development); a lecturer of Developmental and Regional Economics at the PhD level. (EAG) Agricultural Economics, (MAEP) Agricultural Economy and Policy, (MFTB) Financial Market and Exchange, (MGRP) Globalization and Agricultural Development, (MRUR) Rural Development. FP7 – Food Consumer Science in the Balkans: Frameworks, Protocols and Networks for a better knowledge of food behaviors, European Commission, 2008-2011. The support system for cooperatives in Serbia and Lessons Learned, UNDP 2009.
Business Enabling Project: Financial Market Development, USAID 2011-2012. FP7 – International comparison of product supply chains in the agri-food sector: determinants of their competitiveness and performance on EU and international markets, 2012-2015. FP7 – Global and local food assessment: a multidimensional performance-based approach, 2013-2016. H2020 – Sustainable finance for sustainable agriculture and fisheries, 2015-2019. 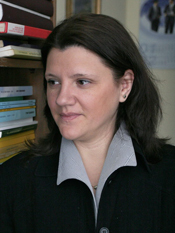 Žaklina Stojanović, Gnjatović Dragana (2015): Cooperatives in Serbia (in Serbian), Hisperia Edu, Belgrade. Žaklina Stojanović, Rakonjac Antić Tatjana, Popović Petrović Ivana (2015), The impact of catastrophic risks on agricultural sector in Serbia, in: Jelena Kočović, Biljana Jovanović Gavrilović, Vesna Đukić (red. ), Catastrophic Risks and Sustainable Development, Belgrade: Faculty of Economics, University of Belgrade. Žaklina Stojanović, Dragutinović-Mitrović Radmila, Laniau Matine (2013): Products with nutrition and health claims in the Western Balkans: labelling behaviour, regulation and policy implications, European Journal of Law and Economics, DOI: 10.1007/s10657-013-9386-z. Dominique Barjolle, Gorton Matthew, Milosević-Djordjević Jasna, Stojanović Žaklina (ed.) (2013): Food Consumer Science: Theories, Methods and Application to the Western Balkans, Springer, The Netherlands. Žaklina Stojanović, Filipovic Jelena, Mugoša Boban (2013): Consumer acceptance of functional foods in Montenegro, Montenegrin Journal of Economics, Vol. 9, No. 3. Iris Zezelj, Jasna Milosevic-Djordjevic, Zaklina Stojanovic, Galjina Ognjanov (2012): The motivational and informational basis of attitudes toward foods with health claims, Appetite, Vol. 59, Issue , pp. 960-967. Zaklina Stojanovic, Svetlana Popovic (2012): Labour Supply and Demand Mismatches in the Rural Serbia – The current state and consequences, print in ed. Cvijanovic D., Subic J., Andrei J., Sustainable Agriculture and Rural Development in Terms of The Republic of Serbia Strategic Goals Realization within The Danube Region, IEP, pp. 975-990.